Hi, I've been looking around to buy my first sword and so I thought I'd ask for some advice from some of the experienced people on this forum. For my sword I'm looking for a longsword from the early medieval period, somewhere around the 12th-14th century, something that the crusader and Templar knights would have used. I'd like something that is somewhat optimised for cutting, I believe a Type XIIIa is what I'm looking for. I saw Darksword armouries had what I'm looking for in their Templar Swords model #1339 and #1340, however I've read bad things about DSA, like they are too heavy, not a good cutting surface etc. However as of yet I've been unable to find a good similar model other producers so that's where I'm looking for suggestions. My price range of around $400-$1000, I want something that is somewhat historically accurate, reasonable handling, good quality and durable construction that I can use to cut things up with and practice my swings. I don't want something I would be deathly afraid to damage because it cost more than a lot of cars. While I do not own this particular sword may I suggest this sword. You would have to stretch your budget but it is considered a XIIIa and fits your time frame. While not a XIIIa, the Albion Squire Line Late 13th Century Greatsword otherwise fits your description, as well as your price range: http://www.albion-swords.com/swords/albion/sq...rd-MII.htm You would have to pay extra for the sharpening though, which does have a secondary bevel. Thanks for the suggestion. It looks like a good sword. It is a bit of a stretch of my budget though, considering I live in Australia I have to deal with unfavourable conversion rates, large shipping fees, 10% GST on items over $1000 and I also have to pay extra for the scabbard. I'll keep it in mind and consider increasing my budget depending on what other options come up. Thanks for the suggestion, indeed that's what I'm looking for and it seems like a very nice weapon. I know Albion has a reputation for being expensive but the price seems very reasonable. I may have just found my sword. The Albion Steward is just over $1000.00. 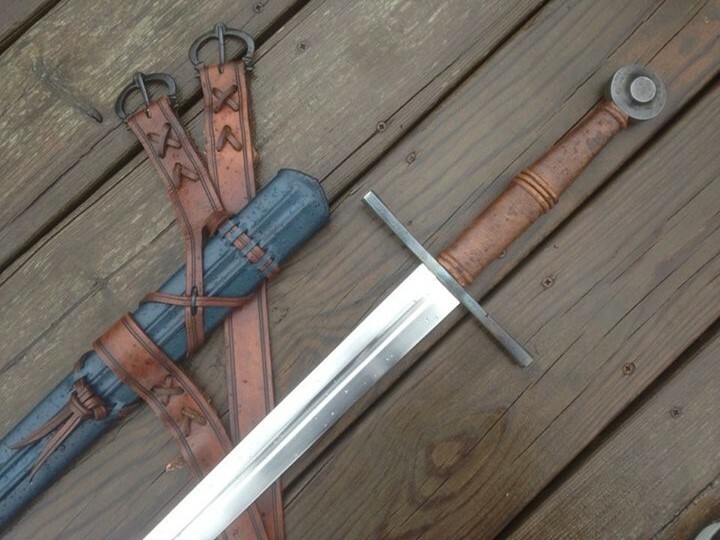 But if you want a good sword, I sayk go with the best - https://www.albion-swords.com/swords/albion/nextgen/sword-medieval-steward-xiiia3.htm - There are other XIIa's and XIIIa's there, between $1000.00 and $1100.00. This sword from Valiant Armoury looks good, and it comes with it's own scabbard which is important to me. But it is almost a pound lighter than similar swords, I thought that a bit odd. I don't want a sword that is too light. Thanks for the suggestion. They look like sturdy swords, but Agincourt looks a bit smaller than what I want. I'm thinking something around 45 inches or more. I'm considering that model, unfortunately I don't live in the USA either. Well, better to save up IMO, you will probably end up selling the cheaper stuff to buy better quality swords in the end anyway. And since you are located in Australia there was was a guy selling a Svante in there. I'ts way more in terms of price, but you save up on shipping, which considering you are overseas can get quite costly. And it's an almost-exact replica of an original sword. Costs a lot of monnies tho even with the greatly reduced price. Sonny at Valiant was courteous, professional, and stuck to our agreed deadlines. He was happy to customize my order and was a real pleasure to do business with. I consider Valiant swords to be the best intersection of price/quality out there today. I'm mostly happy with the sword but there are a few negatives: the peen is sloppily finished, and the weight as you mentioned is a bit light. Not ahistorically so, but on the lighter side for this type of weapon. I would not let these two drawbacks prevent me from buying Valiant again; if I was looking for another sword they would be at the top of my list. Generally speaking, your inclination to save for a higher quality entry point is a good one. For my first sword I went for the DSA, and was disappointed. I wouldn't put that weight outside the workable range Rob. I use one of my own of similar weight for HEMA fighting, and it's not short of blade presence. I'd second the suggestion of Manning Imperial for high-end quality and historical accuracy. If an Albion or A&A (or something of similar quality) is at all within your budget, I recommend spending the money. When I was younger, I picked up a few cheap ones just to have a sword and found them strangely unsatisfying. The hand knows a fine weapon when it holds one. I have two swords from Manning Imperial. Love them both. Pricing is very reasonable for the quality. He also works with Valiant. His own line appears to be more refined but is still in your price range. They are also at Kult of Athena.